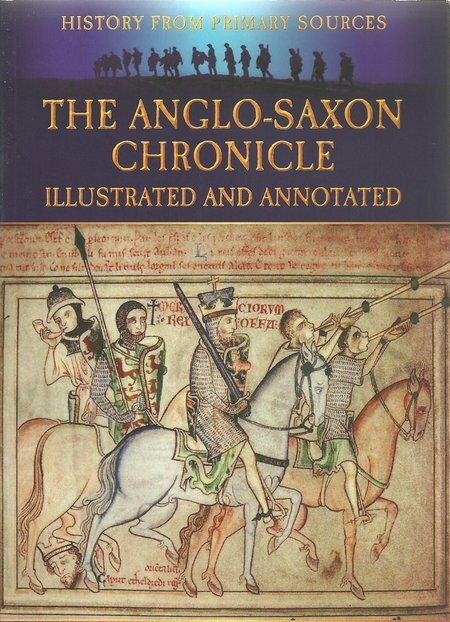 Given the origins of available material, this new book very wisely produces a variant of the Anglo Saxon chronicle that is an amalgam of the available fragments, sensitively edited by Bob Carruthers and introduced by him in an attempt to provide an even perspective. The resulting text has then been illustrated with a selection of images that enliven and add to the text. The composite of this effort is a remarkably readable and absorbing story. The time line runs from 60 BC to the death of King Steven in 1154 AD, therefore covering a much greater period than the commonly accepted Anglo Saxon period. In the same way that a king’s family tree might take great liberties with the reality, the Chronicle seeks to ground itself and, by association, imply that it is part of the true history from ancient times. DESCRIPTION: The Dark Ages is a period of history of the British Isles that broadly runs from the withdrawal of Roman Legions in the Fifth Century to the arrival of the Normans in the mid Eleventh Century. There is some debate about the exact timings, although most historians agree that the Norman Conquest ushered in the Medieval Period and a growing selection of written records to illuminate historic events and trends. The start is less of a consensus but is generally accepted as the point where Roman Administration ceased. One reason for debate and confusion is that records became harder to find from the early part of the Fifth Century, but there was a period of Romano British administration that preceded the withdrawal of the last Legions and continued on into the Sixth Century in some parts of the British Isles. Equally, there is some debate about the start of the Anglo-Saxon period and the numbers of Germanic arrivals. There is also some debate about the reasons for their arrival. The scarcity of any written records in itself justifies the description of the period as the Dark Ages, but there have been theories that this period also saw reduced sunlight and reduction of average temperatures. This has not been adequately studied and one reason is that global warming fraudsters have been anxious to avoid discussion of the typical temperatures before the Seventeenth Century and particular discussion of the probable influences on temperature. The fear was that this could rapidly call recent claims of massive and fatal global warming due to man-made carbon output in the Twentieth Century, based on a brief period of modest increases between 1975 and 1997. This demonstrates that even in an Age of Information Overload, finding reliable primary sources of information can continue to be difficult. It also places in perspective the limitations of the Anglo Saxon Chronicle as a primary information source. There is a myth that historical records were good, extensive and reliable in the period before 435 AD. The reality is very different. We do have some brilliant written material going back into pre-history, but it is fragmented and much has not survived. We know that much of the accumulated knowledge was lost with the fire that destroyed the Great Library of Alexandria, but it is now clear that large sections survived in Arab hands and were appropriated. There are some outstanding segments of literature from the Ancient Greek and Roman periods, records of trading, of maintaining armies, of politics and religion, but there are also a great many gaps. The Anglo Saxon period may therefore not be relatively as sparsely recorded as in earlier ages. It is also true that historical records from other earlier periods were not any more impartial and honest than Anglo Saxon histories. Perhaps it is more a case of the Anglo Saxon period not being researched and discussed in as much detail as Ancient Egypt or any of the earliest civilizations of which we have some knowledge from fragmented documents that have survived. Even the Christian Religion is dishonestly documented and regularly encourages conspiracy theories. Whatever its real roots, Christianity is primarily documented from a period after the death of Christ when the gospel writers were either very old or people writing in their name from indirect information. There were several early strands of Christianity, of which the Roman Church and the Cathar are the best known. The ruthless elimination of alternative records and histories by the Roman Church have destroyed or hidden many important pieces of information and developed a culture of Monks producing records that are at best partial and at worst serious distortions for propaganda purposes. This is important both in placing Anglo Saxon history in perspective and in understanding why the Monks who wrote the Chronicle may have been less than accurate in their recordings. The Anglo Saxon Chronicle is a collection of papers written by Monks. The most famous writings from the period were by the Venerable Bede, but he was one of a number of chroniclers who were located in the various Anglo-Saxon kingdoms and keen to provide documentation that painted their particular kings and patrons in a light that was favourable and saw them favoured in return. The nine known fragments of the Chronicle are not inter-locking chapters of a continuing record, but are a series of documents that overlap each other in parts and contain some disagreements. Material has been added in the Tenth Century that may have come from earlier times. As the Chronicle provides an interesting record of the evolution of the English language, it is also based on, and subject to, translations and qualifications, the nine fragments themselves not being original documents but surviving remnants of copies of possibly original documents or even copies of copies. There is also no reason to believe that the Chronicle is to be believed more strongly than the verbal histories of the Nordic Sagas. However, this is the best we have and it must serve as a primary source of historical record, or at least historical opinion, for the Anglo Saxon period. What does not help us greatly is that, from the Anglo Saxons, on into the Renaissance, kings have been keen to produce fanciful family trees that show them directly descended from Adam and Eve. That is not just ego, but an important device to ‘prove’ their right to be kings. In a very literal age when the Bible was considered an accurate historic source, these created documents were not obviously incorrect. Unfortunately, they influenced what were intended to be modern records of the current times. A king could hardly afford to support any document that did not completely support his claims to right of kingship. It is not easy to pick out some of the important gems from the many contradictions. Within the Chronicle, it is accepted that Anglo Saxons arrived at the invitation of a Romano British King to fight on his behalf as mercenaries against the Northern tribes from what is now Scotland. It also records that they later fought against him and the implication is that this was the start of an Anglo Saxon invasion. Research and the results of archaeological digs are beginning to question that version, suggesting that Nordic immigrants arrived earlier and came in relatively small numbers that increased to some degree after the Roman Legions withdrew. However there is much confusion and the Chronicle is not exempt from this. Even the racial and geographic origins of the Anglo Saxons are far from fixed. The Angles themselves claimed to have come from Sweden, commonly from Southern Sweden. The Jutes are believed to have originated from Jutland and Schleswig. The Saxons have been described as coming from Batavia, modern day Holland, and from the German Plain, but it is becoming increasingly clear that this migration also included people from further afield. As the Vikings came from these areas and Norway, it is virtually impossible to identify who came from where, when and why, much less to identify the numbers in specific short periods. Until another source can be identified, or other findings verified, this new edited and illustrated compilation is the best version of events we have. Where a chronicler quotes a figure for the size of an army it is best to think of it as “a large number” but that applies to most histories even into modern times. From as recently as 1940, we have several claims for the total number of British and German aircraft destroyed during the Battle of Britain. Probably none of these records is accurate but some will be better guesses than others. When Dowding was asked to provide proof for use in news media and political discussions in America during the Battle, he expressed the view that if the British figures were wildly wrong the Germans would be in London within a week and if the Germans figures were wrong, the RAF would establish air superiority over England and then extend it to the European mainland – the words of a commander fighting a desperate battle and not keen to devote his thoughts to what he regarded as petty propaganda. The result was that the British representatives in the US simply made up their own claims and carried on with the propaganda war, in much the same way as their German opposite numbers. It is likely that much the same happened in Anglo Saxon times, when the victor wrote the surviving history and the scribes filled in any inconvenient gaps, massaging the final action to please the ruler and enjoy his support. Equally, some accounts may have been written long after the event from several very indirect sources. The surviving ruler was not the only influence of the Chronicle. The surviving core of the Christian religion is the Roman interpretation. Even the Protestant factions adopted most of the core of the Roman history of Christianity. That history differs considerably from the original basis of Christianity. Where the teachings of Christ appear to be very close to the teachings from examined Dead Sea Scrolls, the character applied by Paul is Greco Roman, where the concept of making Emperors gods was applied to the structure of Christianity. As the new religion spread across the Mediterranean and North toward Scandinavia, the evangelical priests adapted their religion to local practices. Churches were built on or out of Roman and Nordic pagan temples, and religions celebrations recalibrated to match the old feasts and absorb symbols from the old religions. As the monks who wrote the Chronicle were also busy writing the ‘history’ of Christianity, there was inevitably cross fertilization of ideas and convenient distortions. This new book provides a valuable collection of views and it is impossible to understand the greatness achieved by Britain without understanding the why in which the Anglo Saxons laid a foundation, on which the Normans built further, to create a single nation that was eventually to expand and defeat much larger and wealthier nations on a march to the first global Empire. Within the Chronicle are all of the elements that created Englishness and expanded into a British character that was resourceful and innovative, making the break from agriculture to industry and dominating the world stage beyond anything that could reasonably be expected and in a way that held ‘reasonable’ to be an important goal. The translation is primarily that done by the Rev James Ingram and the footnotes are his, supplied for completeness. The Parker Manuscript is also included and this makes the book the most complete history based on the primary surviving sources of the Chronicle.